You know the saying "Some of the best things in life are free"? Well, this is one case where it's absolutely true! Bien was given to us when she was about 10 months old. Her previous owner (and breeder) was George Hickox. 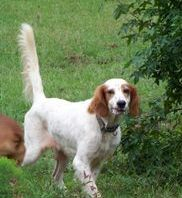 Anyone who knows Setters should know that name! To make a long story short, Mr. Hickox did not feel that Bien's hips were "up to par" and made the decision to remove her from his line-up. At the time, he was in coastal Georgia, and the vet he visited just happened to be the same vet we used. Dr. Christiansen really liked the young pup and asked Mr. Hickox if he might consider giving her to a good home - someone who would love her and care for her, regardless of her hip health. Mr. Hickox agreed, and Bien came to live with us. First and foremost, we would like to thank George Hickox for this free dog. She is INCREDIBLE. Our trainer is continuously impressed with her trainability, intelligence, and desire to please. Bien was whoa broke as a Derby dog, and finished her Field Championship by the time she was 30 months. 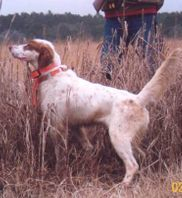 In 2003, when she was just 23 months old, she placed 4th at the AKC Pointing Breed Gundog Nationals (non-retrieving). At that date, she was the youngest dog in AKC history to place at the Gundog Nationals. In 2004 she won the American Field Waterford Classic in Minnisota. 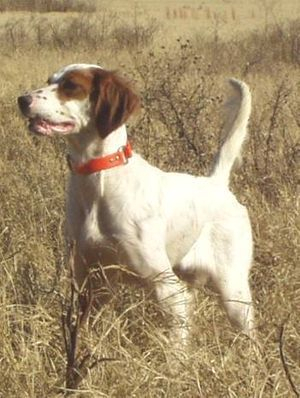 Hunting is what Bien lives and breathes for. She has the heart of a lion, and easily outruns a one-hour course. 30-minute stakes don't begin to slow her down. She is phenominal to watch, taking lines and hitting objectives with minimal direction needed. She is definitely "poetry in motion." 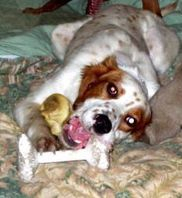 In October, 2006, Bien started to show signs of severe, painful hip dysplasia. After consulting with several orthopedic specialists, we decided against surgery. With aggressive physical therapy and acupunture, we have been able to let Bien continue to run and hunt. Her first field trial after extensive therapy was in March, 2007, in Collierville, TN. We thought she would be ready to handle a 30-minute walking trial. Bien broke away like her tail was on fire, and for the next 30 minutes, we didn't see a lot of her! She was definitely ready to get back in the game...but maybe horseback trials! We'll continue her physical therapy and acupunture to keep her comfortable, and to let her keep doing what she loves the most - run and hunt birds. If she ever does get to the point where she just can't do that, she will have orthopedic surgery to remove her damage hip joints and retire to our sofa to watch quail hunting shows on OLN.